Staying on the theme of breakfast, another option located conveniently on the Parkway is Atrium Pancakes and they serve, you guessed it, pancakes. However, they don’t just serve pancakes, even though they have about 25 different varieties of pancakes. Their lunch is filled with options for those watching their waistlines; the grilled chicken breast is one such option that is regularly featured as a lunch special. They also have a cucumber, tomato, and onion salad on the menu marinated in their homemade Italian dressing. Now I haven’t tried their lunch menu to be completely honest, but the breakfast I have, and it features the most popular item maybe in the entire town. 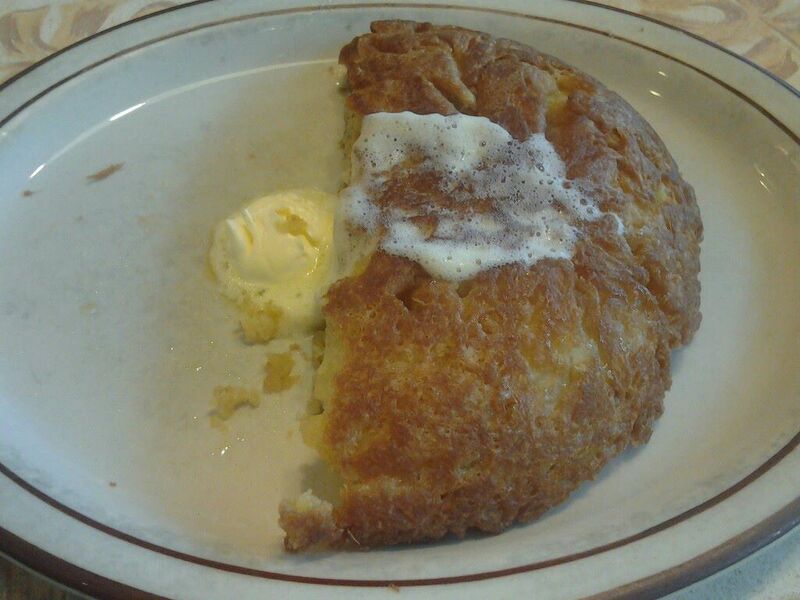 The Baked Apple Pancake is a glorious monstrosity of a pancake. It’s not even fair to call it a pancake, because it’s size is more reminiscent of a cake. It is baked in a large 8 inch pan, and the inside is filled with sliced apples, and topped with a huge dollop of whipped butter. A normal person with an average stomach cannot possibly eat the whole thing in one sitting, so I would recommend sharing this. It is scratch-made in the kitchen, so it will take a little longer for it to make it out to your table, but it is well worth the extra 5-10 minutes. We have been here three times on our six total times on vacation in Gatlinburg, and I have to say on a final note that the service has been excellent every time, and the prices are better than reasonable. There is also plenty of free parking next door at the Crossroads motel if you are not on foot. Don’t be fooled by the exterior, this is a solid place to eat in town. We will certainly be back for trip number four soon.